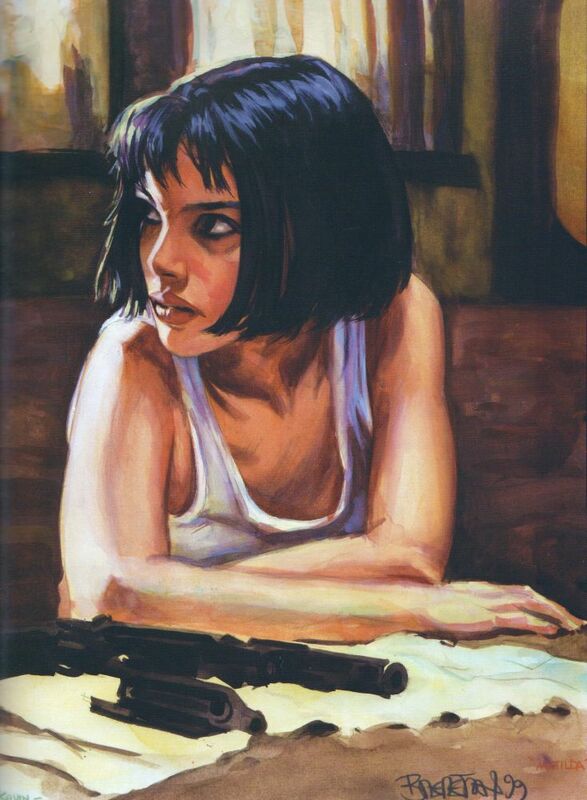 Dan Brereton’s new portfolio book In The Night Studio arrived just as Tom Spurgeon asked for suggestions of great cover artists and also just as I happened to see again the terrific 1999 painting by Brereton of a twelve-year-old Natalie Portman in Leon. Brereton loves monsters and a particular strand of gothic horror, but his portraiture is just as individual, going beyond resemblance and into characterisation. He did a painting of Ian McShane as Al Swearengen in Deadwood that makes the sheriff look like an icon carved out of dented hickory, and his versions of comic book characters work a similar trick. In an earlier studio book there’s a picture of Iron Man as a primitivist golem against a thunderous sky, a ton of implacable matt statuary that might have wandered in from Zardoz, the colours in the armour seeming like seams in rock. All pretty much the opposite pole from the slick silicon techno-cop Tony Stark is usually portrayed as for ease of identification. Brereton’s version of Hela, one of the most striking female designs Jack Kirby ever came up with, has all the formidable otherness of the original but with an added delicious louche sensuality that Kirby never embraced easily, and to say that the Cate Blanchett version in Thor Ragnarok is a pale imitation isn’t the half of it. Accurate resemblance is more to the point in The Beatles Story, the latest British comic from the past to be spruced up by Rebellion’s archiving project. It spins through the story of the band at a hectic sprint and leaves most of the messy complications out of it, although perhaps that’s fair enough for a strip that appeared in Look-In during 1981. Arthur Ranson’s photo-likenesses were a feature of other Look-In strips too, but most of those were fiction. Here, when he draws Yoko Ono looming out of half a panel’s worth of spotted black, he’s doing it with at least some commentary on real life. I reviewed it for Tripwire, remembering the days when comic strips were part of mass cultural education about things happening over the horizon, not to mention the days when that rescue mission took place in high-street newsagents.